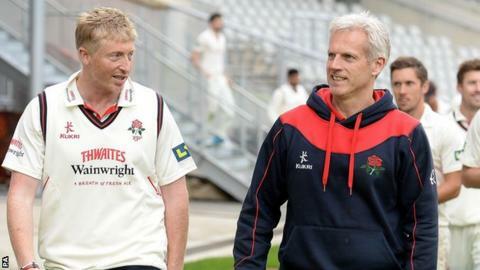 Captain Glen Chapple will take control of Lancashire for the rest of the 2014 season following the departure of Peter Moores to become England boss. Seam bowler Chapple, 40, has played for the Red Rose county for more than two decades and led the side throughout Moores's five-year reign. He will be assisted by ex-Lancashire spinner Gary Yates, who was already on the club's coaching staff. Lancashire return to Championship action at Northants on Sunday. Moores left his position as head coach following the Division One fixture with Warwickshire, which ended in a draw on Wednesday. The 51-year-old will now begin his second spell with the national team, having been in charge for nearly two years before his dismissal in January 2009. Speaking prior to Friday's announcement, Chapple told BBC Radio Manchester that working alongside Moores has increased his desire to stay in the game at the end of his playing career. "I rate him very highly as a coach," Chapple said. "The lads are very pleased for him because he's been terrific for us as a coach. We wish him every success. "He's taught me a lot about the game, about what you see from the sidelines when you're not a player, and in that respect he's inspired me to want to stay in the game. "My role will inevitably be bigger because Peter's not here, but at the same time I've been involved in team selection for five years now. "We've got a lot of resources at the club and a lot of highly qualified coaches, and we'll back ourselves to be great until the club tells us anything different."